The La Silla Observatory is ESO’s first astronomical site in Chile. Its construction started in 1965 and its official inauguration was celebrated on 25 March 1969, with the presence of the President of the Republic of Chile, Eduardo Frei Montalva. The La Silla Observatory is located at the outskirts of the Chilean Atacama Desert, 600 km north of Santiago de Chile and at an altitude of 2400 metres. It is reachable by taking road C-541 from the intersection located at km 594 of Ruta 5 Norte (Chilean Pan-American Highway). More detailed information about how to reach La Silla Observatory is available here. We advise you to reserve accommodation and transportation as far in advance as possible, as this is already in short demand in much of the region. There is no accommodation at La Silla. Members of the public will be asked to present your confirmation from the shop at Camp Pelicano, will together with your ID before boarding the bus. Note that the tickets are not transferable. Please do not count on being able to bring more luggage onto the bus than you can carry, and a maximum of 13 kg. Due to possible traffic jams, we advise you to be in place at Camp Pelicano early in the morning, and at the latest at 10:00 on 2 July 2019. Accreditation begins at 09:00 (TBC) . The probability of a totally clear sky at La Silla during July is around 40%. There is aaround 55% chance that the sky will be partially clear. There is a probability of more than 30% that there will be a thick cloud cover. The likelihood of a clear sky at La Silla is higher than in most other regions that will also experience the eclipse and slightly better than in the nearby Elqui Valley, but naturally no guarantees for clear weather can be given. 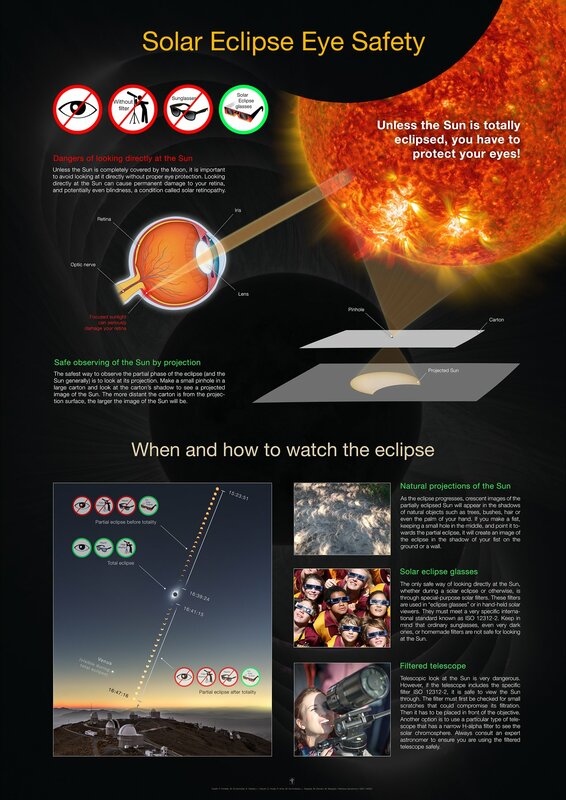 Viewing of the total solar eclipse is weather dependent and ESO does not make a guarantee that the eclipse will be viewable. ESO will organise a programme of activities at the La Silla Observatory also in case of cloudy weather. Please note that tickets will be refunded only in case the event has to be cancelled because of adverse meteorological conditions, natural disasters or any other event which may compromise people’s safety. More information is available here. 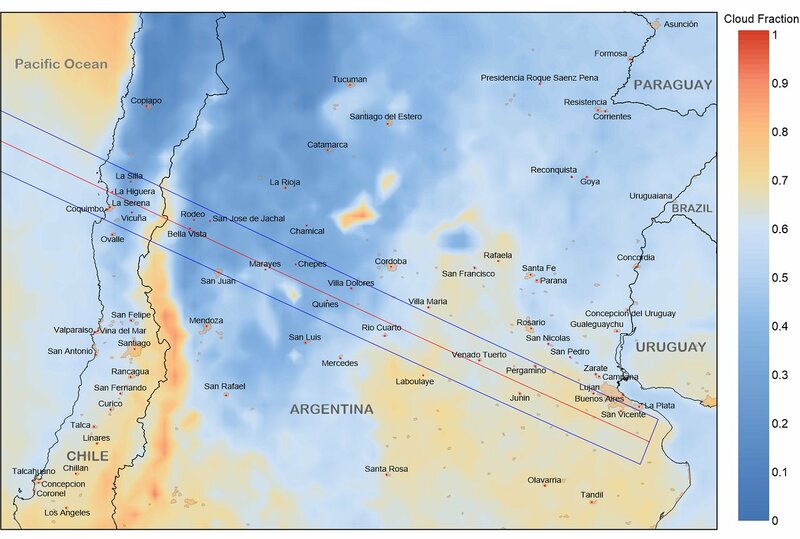 Average July afternoon fractional cloudiness along the eclipse track over South America. Data are extracted from 14 years (2002-15) of observations from the Aqua satellite. July is winter in the Southern hemisphere so it will be cold! The mean temperatures in the beginning of July, between 12:00 and 18:00 at La Silla (2 400 metres altitude) is 13ºC. However, there is a 6% chance of temperature going below 0ºC. July is also very windy at La Silla, windbreaks regularly reaches speeds up to 20 m/s. Therefore the wind speed will be a main determining factor for the perceived temperature. Moreover, the “mirador” (viewing location) has a fantastic view. There will be a tent, but, it is recommended that visitors come equipped with warm and comfortable clothes and shoes, as well as a windbreaker. General Health & Safety information for visitors is available here. La Silla is located in a remote location in the Atacama Desert. It is a working observatory in operation 365 days a year, 24 hours a day. One of ESO’s first priorities is ensuring the undisturbed and continued operation of the observatory. Active telescopes at La Silla work in visible and near-infrared light during the night while daytime is used by engineers and technicians for maintaining and preparing telescopes and instruments for the upcoming night. Every visitor to La Silla (or any ESO site) must read and sign a Release Form in English or Spanish. These forms will be sent by email and have to be filled out by each participant or guardian. You will have to watch an online safety video and agree to the safety rules on site. This form will be sent to you by email. For safety reasons, children under 4 years are not allowed. For safety reasons, minors have to be accompanied by an adult, who can be responsible of 10 young people at maximum. No private vehicles will be allowed on the mountain. All private vehicles will be parked at the Main Gate area (Camp Pelícano). Visitors will be transported from the gate to the mountain top (round trip) by ESO minibuses. All the visitors must leave the observatory right after the end of the eclipse. This means boarding onto ESO minibuses will start soon after the end of the eclipse around 18:00:00. The boarding order will be decided on the basis of logistical needs. Visitors are not allowed to walk around alone outside the designated areas, which will be clearly marked. Tours at the observatory and access to the telescopes is allowed only in guided groups. Visitors’ Area will be provided with toilets, chairs and garbage containers. Visitors must be respectful of the environment, the site itself and the people working there. ESO guides will be there to welcome you and assist you during your visit. Visitors must listen to their ESO guides and event staff while attending the event for safety of themselves and the site. Chairs, toilets and garbage containers will be available at the site. The observatory will also have a Safety Brigade and Paramedics available for emergency situations. Transportation to the main gate of La Silla Observatory (Camp Pelícano). Public visitors must arrive at Camp Pelícano on time and by their own means. Parking will be available at Camp Pelícano. Please note that private vehicles will not be allowed beyond this point on. Accommodation. It is recommended that visitors arrange accommodation as early as possible. Food and drinks. As this will be an all-day event, it is also recommended that visitors plan to bring lunch and snacks. Water, hot beverages and light snacks will be provided, but visitors should also plan to bring their own water and non-alcoholic drinks for the day. 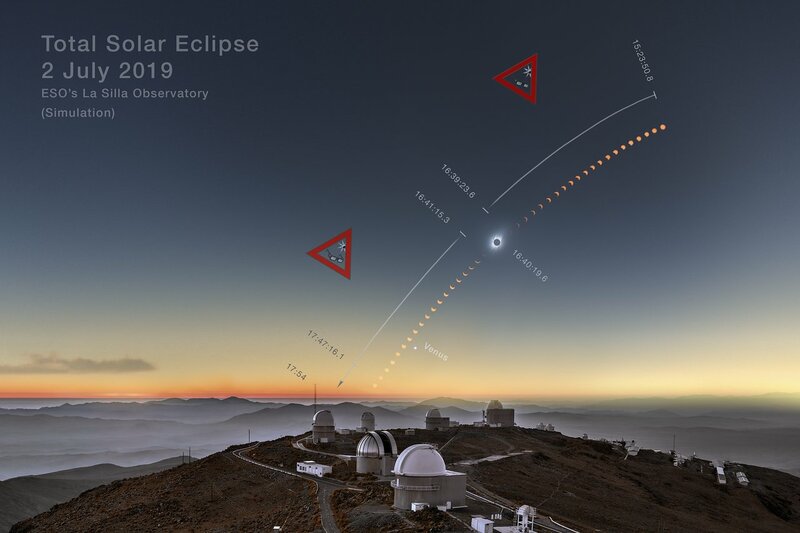 This clear-weather simulation timeline shows the phases of the total solar eclipse 2019 at La Silla. Credit: ESO / P. Horálek, M. Druckmüller, P. Aniol, Z. Hoder, S. Habbal. On site there are events planned for the media on 2 July. 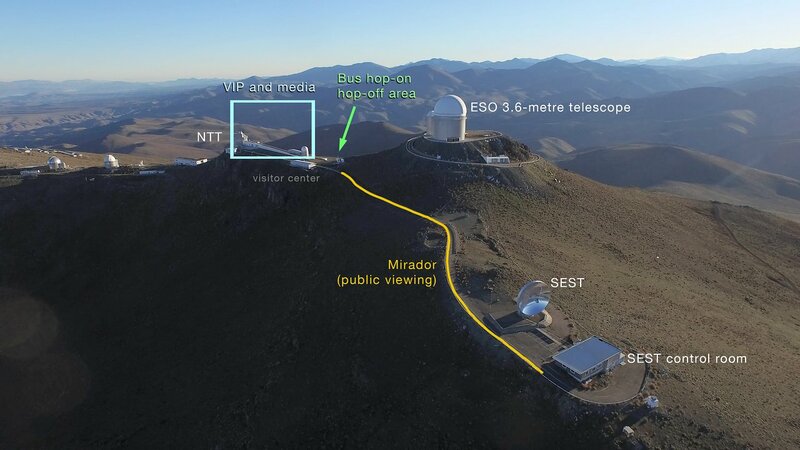 In addition to the public event at La Silla, ESO plans to deliver a live stream online which can be used at locations throughout Europe and beyond, including the ESO Supernova Planetarium & Visitor Centre in Garching bei München, Germany. ESO sees the 2019 total solar eclipse is a great opportunity to also commemorate 50 years since the official inauguration of the La Silla Observatory on 25 March 1969. If you are interested in more details of the great history of ESO, please see our timeline. There is very limited infrastructure on La Silla, so visitors cannot count on having Internet coverage on site. Wireless LAN is not offered. There is some, but limited, cell phone coverage on site. By taking a virtual tour on La Silla you can have a preview of the surrounding landscape and facilities.